And among the first to benefit was Willard's Sean Wilson, warming up with a 6-pounder midweek and then getting a 12lb fish during the early hours of Monday. He had that one on fake corn – fished not too far out – and then decided to 'sit it out' in the hope that it wasn't just a one-off catch. 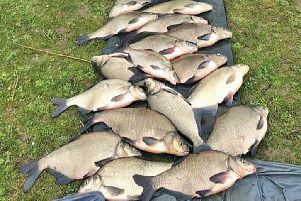 Waters Edge reports bream and tench to 6lb from Heron Lake, Tim Hill being among the captors. WILLEN Hospice had a great 'catch' during MKAA's annual meeting, 'landing' a £3,000 cheque – mostly the proceeds of last year's Furzton Festival matches. That was presented by angler Chris Benton and collected on behalf of the Hospice by Tracey and Andrew (pictured). MATCHGROUP's Ben Bell is really on fire. This time out he topped Alders' midweek open with 65lb as team-mate Bryn Wignall had 58lb with Lee Newson third on 57lb. MK Vets, Tear Drops: Paul Chapman 12-3, Kevin Osborne 6-7, Barry Witteridge 5-7. MILL Pond series, Husbourne Crawley: Nigel Bass 10-6 (roach and skimmers), Ricky Wright 9-2, Steve Chilton 7-2. TOWCESTER Vets, canal, Navvi: Rob Rawlins 9-4, Tosh Saunders 5lb, Les Goodridge 3-4. NENE/Towcester, canal, Heyford: Baz Eaton 4-15, Dave Gibbins 4-2, Tosh Saunders 3-12. TRING arrived for their Wilstone canal match, to find it two-feet down. Opting to fish the central channel – a la 1976 drought – results were better than expected as Simon Foulkes had 12 bream for 17-14. Chris Bartlett-Howard 10-15, Martin Roswell 9-8. JUST how big do pike grow in fertile local balancing lakes? On the Willen north island (working for the Parks Trust) Ross Jackson found the skull of what could only have been a mega pike. He reckons that – wider than his boot and at least as long – the fish had to have been at least a 40 pounder! GONEFISHIN's Friday night shop open-night (featuring Alan Blair and Michael Buchwalder among others) was a hit, pulling in some 70 to 80 visitors. MARK Lloyd – Angling Trust chief exec since its formation 10 years ago from the NFA, NAFAC, ACA and the national sea anglers among others – is off to head the national Rivers Trust, the umbrella organisation for more than 60 river trusts. FIXTURES: April 14, Mill Pond open, 07854 649279; entries open for MK canal spring league teams-of-four, 01234 713144, starts April 21.